Musical numbers — We have a film clip of each number highlighted in bold navy blue in the list below. “Lovely Lady” and “Harmony Babies” haven’t been found. 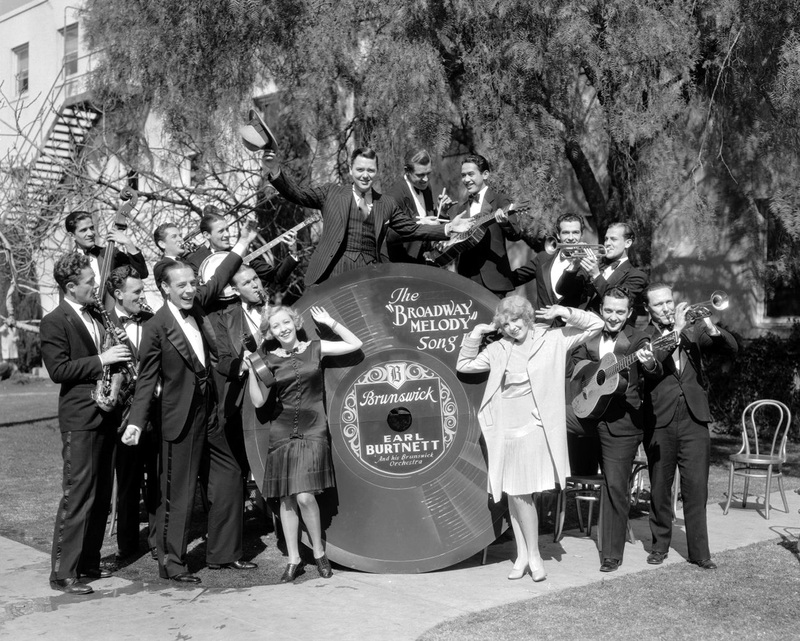 (Above) 13 February 1929: Charles King, Bessie Love and Anita Page pose with Earl Burtnett and his Brunswick Orchestra and a huge replica of a record. 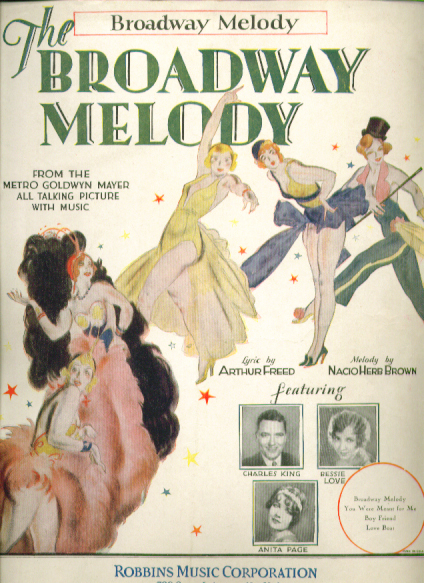 They are promoting the 1929 MGM musical film The Broadway Melody, winner of the Academy Award for Best Picture. Note: the following two photos and the sheet music cover for the song Broadway Melody came from the fine site Eskimo Spit Bath Orchestra (defunct). 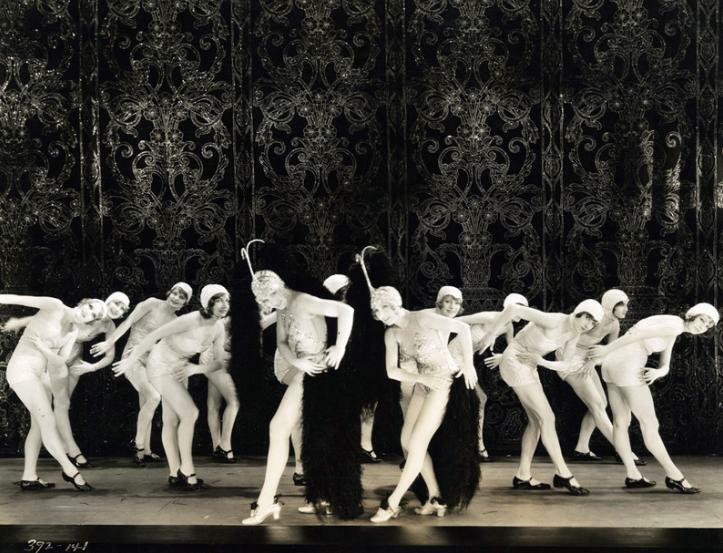 The Broadway Melody is a 1929 film musical, the first sound film to win an Academy Award for Best Picture. 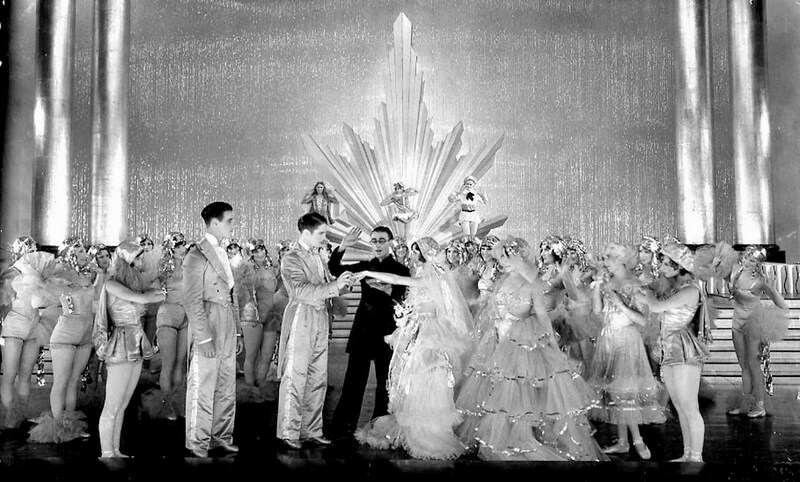 It was one of the first musicals to feature a Technicolor sequence, which sparked the trend of color being used in a flurry of musicals that would hit the screens in 1929-1930. Today the Technicolor sequence is presumed lost and only a black and white copy survives in the complete film. The film was the first musical released by Metro-Goldwyn-Mayer and was Hollywood’s first all-talking musical. Writers Norman Houston and James Gleason adapted the screenplay from a story by Edmund Goulding. The film was directed by Harry Beaumont. 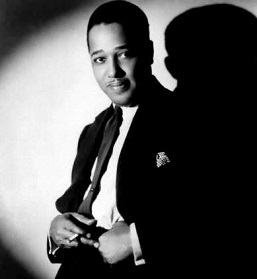 The score, with music by Nacio Herb Brown and words by Arthur Freed, included the popular hit “You Were Meant For Me”. Bessie Love was nominated for an Academy Award for Best Actress for her performance. 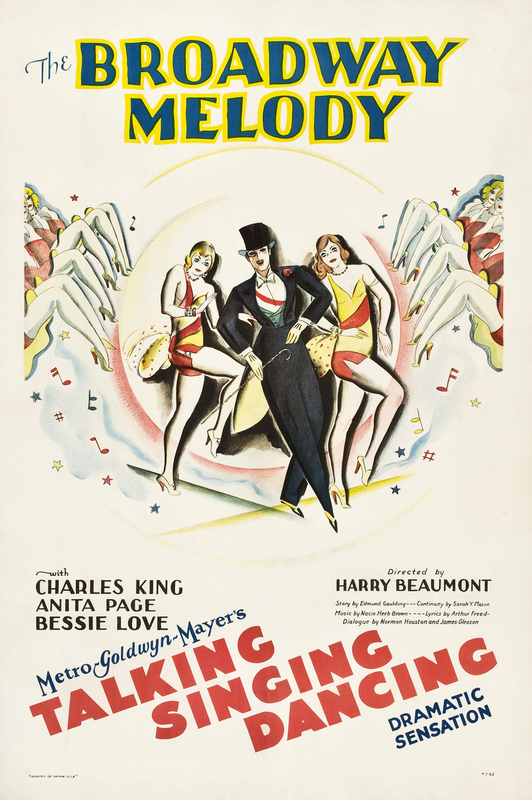 Broadway Melody – The song was used again during the opening credits of the unrelated films Broadway Melody of 1938 and Broadway Melody of 1940. The song has been recorded numerous times including a recent version by Sting (98). It was included in the films Penny Serenade (1942) and Singin’ in the Rain (1952). 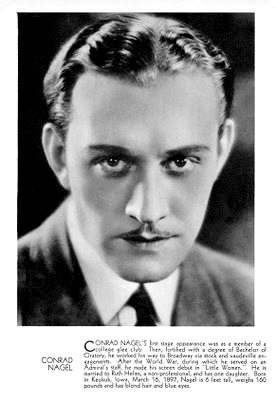 Conrad Nagel sings the song to Anita Page in The Hollywood Revue of 1929, voice overdubbed by Charles King. The camera is on King for a second prior to Nagel’s performance. A bit later it cuts back to King for a couple of seconds, showing him looking disturbed. 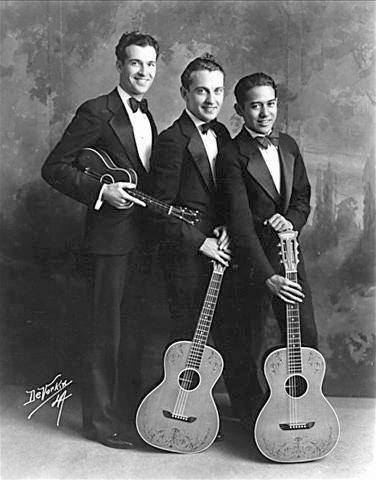 In 1927, The Biltmore Trio, consisting of Eddie Bush, Bill Seckler and Paul Gibbons, joined Burtnett and enhanced the group not only with strings, but mainly with their vocals. 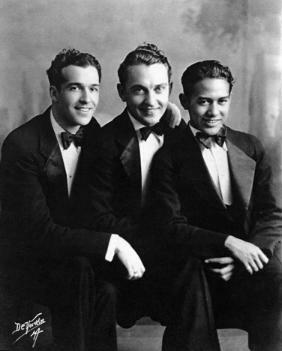 The Trio’s popularity soon rivaled that of the band, encouraging other bandleaders to add vocal trios to their orchestras. IMDb also includes Bush, Seckler, and Gibbons in the Full Cast & Crew list for the film, individually crediting each of the three as “Quartet Guitarist and Singer.” The fourth quartet guitarist and singer listed by IMDB is Ches Kirkpatrick. 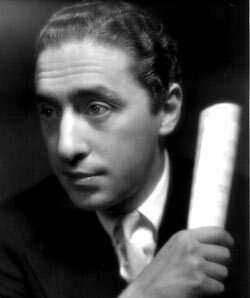 Eddie Lang is also included in the full cast and crew list, but as a “Guitar Player in Band,” not as a member of the quartet. 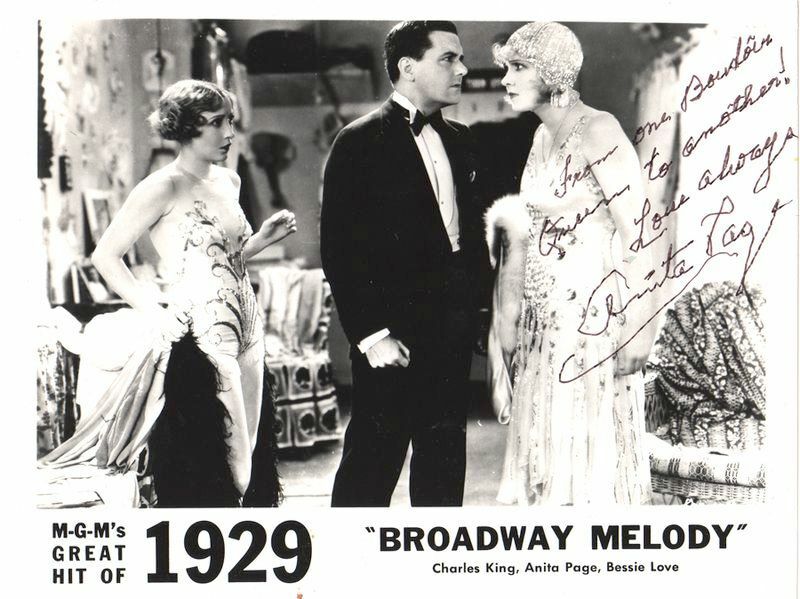 (above) The pair of photos above appears to show three members of the group which performs “Truthful Parson Brown” in the following clip from The Broadway Melody. I take these three to be Eddie Bush, Bill Seckler and Paul Gibbons, based upon the aforementioned credits at the IMDb, and the quote from the Take Two Records compilation cited above. Since he is not among the Biltmore Trio members shown in the above photos, nor among the Biltmore Trio members credited by IMDb for appearances in several 1929-1930 films (see “Note” directly below the video), nor among the members of the trio listed in the Take Two Records quote above, the lead singer and fourth member of the quartet would seem be Ches Kirkpatrick, the only other “Quartet Guitarist and Singer” included in the IMDb cast credits. That one of the “guitarists” in the quartet plays ukulele in this number, while the lead singer holds but does not play a guitar, are details not reflected in the IMDb credits. A summary of films in which the Biltmore Trio (Eddie Bush, Bill Seckler, and Paul Gibbons), and the Biltmore Quartet (same three members, plus Ches Kirkpatrick) appear follows. They were uncredited for each of these films, except the self-titled short of 1929, but have been identified by IMDb, and in other filmographies. IMDb also identifies Bush, Seckler, and Gibbons as cast members, presumably performing as but not specifically identified as a trio, of the third of four 1928 shorts titled Earl Burtnett and his Biltmore Hotel Orchestra. Bill Seckler later became a member of the vocal group Three Hits and a Miss, which soon expanded to become Six Hits and a Miss. * My song list for the film is made from combining lists at Wikipedia and IMDb, using the order found at the former, but adding Harmony Babies from the latter. 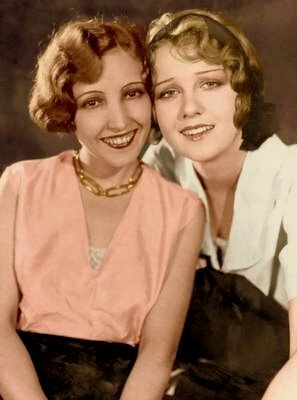 Harmony Babies, according to IMDB, is a Brown-Freed number which is “sung and danced briefly by Anita Page and Bessie Love” and reprised near the end of the film. IMDb also has “The Boy Friend” rather than “Boy Friend.” Truthful Parson Brown is given as Truthful Deacon Brown at Wikipedia. However, ASCAP lists the song as Truthful Parson Brown, with no variant titles. ** IMDb includes the Biltmore Quartet and its members Bush, Seckler, Gibbons, and Kirkpatrick among the cast members of the film The Hollywood Revue of 1929, but they are uncredited on the IMDb Soundtracks page for the film. On the other hand, according legendaryjoancrawford.com (site evidently defunct as of 5 June 2018), a band called the “Biltmore Quartet” supports Joan Crawford during the song and dance number “Got a Feelin’ for You,” in The Hollywood Revue of 1929. That may be so, but I’m not convinced the quartet vocal group backing Joan Crawford on “Got a Feelin’ For You” contains any of the same members as the group that performs “Truthful Parson Brown” in The Broadway Melody, though there are similarities in appearance in a couple of cases. My page on The Hollywood Revue of 1929 includes a video of the cited number, featuring Joan Crawford accompanied by a pianist and the mystery quartet, and copies of two photos of the same six people. Burt, I presume you refer to The Broadway Melody of 1929. It was released in the US in 1929. I’ll guess a DeSoto, as the first model was introduced that year. I have one other now. There was a late 1930s comedy that had three academy award nominations; I will appreciate it if you can provide me with the automobile that was driven in that movie. Hi, I was not testing you, Jim. Sinclairs Auto Miniatures, in Erie, Pennsylvania, was running a contest and, as much searching as I did, I couldn’t come up with the answer. Needless to say, I didn’t win. 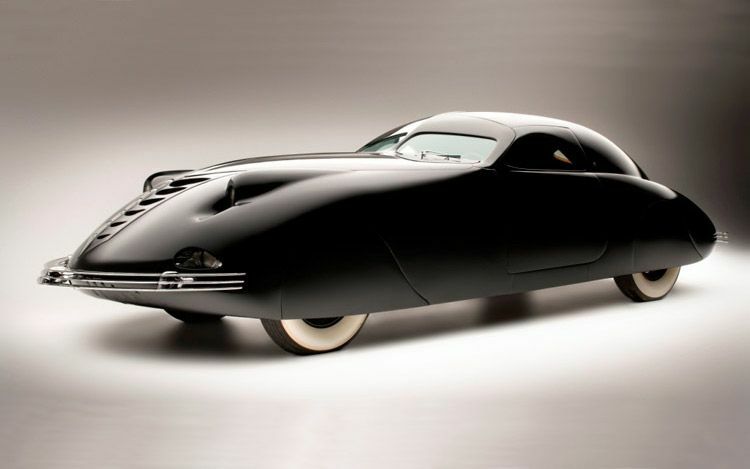 For your information,the car was the one-off Heinz PHANTOM CORSAIR.! Ironically, I happen to have a 1/43 scale model of it in my collection! Anyway, thank you so much for your help and indulgence! That’s quite alright. 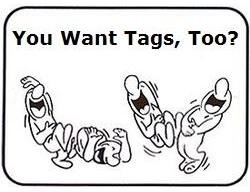 I did happen to find some of your collection on line, at http://clubs.hemmings.com/olds-gmo/tankel.html (Burt Tankel’s Cars page), and found some of your personal social sites. I like the Futuramic 98 Sedanettes, but the second one seems to have a large visor over the windshield which doesn’t look like it would be aerodynamically sound. I added a couple to the list today, and reordered them, listing them in the reverse order in which they are given in the IMDb filmography of Eddie Bush. See also the note above regarding a 1928 film in which Bush, Seckler, Gibbons appear, titled Earl Burtnett and his Biltmore Hotel Orchestra (the third of four 1928 shorts with the same title). However, what you see in this page, and in my page on The Hollywood Revue of 1929, is pretty much the extent of my knowledge regarding the Biltmore Trio and the Biltmore Quartet. If I were to look for the films with the intention of copying or purchasing them I would probably begin with Google searches on the group names, and on the film titles. I would do general web searches and video searches. It took me only a few moments to find that Amazon has Party Girl (1930) and Chasing Rainbows (1930) for sale. Good luck. Thanks, you have a great website.